Writing a song is difficult. Writing a good song is even more so. Songwriting is a labor of love: Though the average song is usually three to five minutes long, it can take hundreds of hours for a song to develop from a small idea into a full track. But somehow, we never run out of fresh tracks: Every day, we put on our headphones and plug into an endless queue of playlists and Spotify stations with our fingertips. How is this possible? We’re usually concerned with what happens in those three minutes of listening to the finished product. As a reviewer, I’m interested in the emotions, images and impressions the song evokes as it falls upon my ears. But we rarely consider what happens in those hours before we hear the music, the hours in which the music grows from an idea in a musical mind into a full-fledged track. The sheer improbability of that process, the journey from idea to song — what makes it happen? I’m a songwriter myself — by no means an expert — but as I’ve come to learn my way around music, I’ve gained some insight about what the creative process really means, and the ways in which an idea becomes a song. It strikes you suddenly, without warning. In that instant, the colors of the world seem a little brighter, and the sounds of the world fade away as you become enveloped by the music. Perhaps it’s a bit cliché to pin inspiration down to a single moment, that quintessential “flash of inspiration,” but the moment that a good musical head finds itself inside my head, I’m instantly captivated as it wriggles inside my head, playing itself endlessly as it struggles to escape — and let itself be heard. I’m a musically minded person — ideas float around my head in every waking moment. Not every idea that comes to me is destined to become a hit, but some ideas are certainly better than others. And those better ideas — the ones that come to me in that abrupt flash, the ones that play themselves over and over tirelessly in my head — are the ones that come to be written down. I open my laptop. I start up a digital audio workstation (DAW), a program that lets me turn ideas into electronic music with a dynamic array of synthesizers, samples and effects. I like to think of it as a musical interface between my brain and the rest of the world. Slowly, the idea works its way from my head to the computer as I painstakingly enter each note and craft each sound from scratch, twisting knobs and noodling the keyboard. It’s a slog of busy work, as I try to bring an idea to life, but my drive keeps me going — I simply cannot leave my desk until that idea comes out of my head. I press play, and often the result sounds terrible. No matter. That’s nothing that tweaking, experimenting and a little bit of coffee can’t fix. I close my eyes and listen once again to the idea in my head, this time more intently, trying to capture every colorful nuance in the sounds. Hours pass by fleetingly as I slowly move through the music. Sometimes this is where an idea comes to die. Sometimes, after hours of trying to translate my thoughts to my computer, what comes out is a garbled mess, a shadow of the idea I had. I find myself unable to articulate my musical thoughts, and the idea dies there, in my head, unheard. But other times, I press the play button for the first time, and beautiful sounds rush from my speakers. I’ll sleep on this idea: if my half-asleep, 3 A.M. musical adventures still sound decent in the morning, then maybe I’ve made something good. The initial idea, that first thing that strikes you when you try to write a song, can only take you so far. 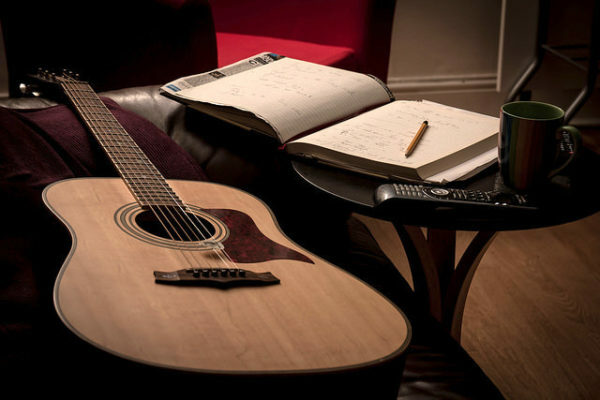 As suggested by its name, the process of songwriting involves many of the same processes as writing. It is a lengthy ordeal that involves quite a bit of slow, methodical work. In a way, it’s like writing a story: you have your main idea, maybe even some sketches of ideas, and from there the details begin to come together. That’s easier said than done: Just as writers suffer from writer’s block, songwriters get songwriter’s block as well. I know I’ve hit that when I listen back to the idea in my head, playing through the music I’ve just written down, and find silence — the flash of inspiration gone. This is the stage in which my songs most often die — I simply can’t force the music to continue, and that song gets filed into my ever-growing folder known as “8-bar loops/Song Ideas.” Perhaps one day I’ll be struck with inspiration again, and then I can finish the song. But that’s an inefficient way to deal with writer’s block. If I want to finish my songs, from this point on, the creative process must take over. What do I mean by the creative process? A process has the connotation of something methodical, of a step-by-step algorithm from which a solution can be found. Unfortunately, music is not so easily tamed. In music, there are no right answers, but there are answers that are subjectively better than others. In other words, there are answers that will make you more money, or more admiration from your friends. In the end, however, the creative process is not a means of methodically finding those right answers, but rather one of discovering them through artistic perseverance and chance. I’m still refining my personal creative process, but I’ve found that a healthy mix of experimentation and crazy ideas can’t hurt. In fact, it’s often happy accidents and a touch of randomness that give rise to even more inspiration and ideas. So, I inhabit this space of accidents and mistakes, if only for a little while, playing with the music and listening to what comes out. I conjure up some sounds, twisting knobs methodically, but randomly, listening to the strange music of my wanderings. I play around and improvise, fingers perched atop my keyboard, curiously prodding the keys in search for glistening moments of beauty. Eventually, something clicks: I get that brief flash of inspiration, and I hear the way forward. This is the longest and perhaps most tedious stage of the songwriting process, as it forces me to stand up against my writer’s block. I’ll be the first to admit that I sometimes I can’t overcome this block. But that’s okay; at worst, I’ve created more sounds and textures to add to my musical palette, and at best, I’ve just found the idea that will finish the hit song that makes me a breakout star, landing me a deal playing at Coachella in two years (in my dreams, maybe). The creative process is a powerful yet fickle thing. It can’t be relied upon at will, but when it exerts its power, it always leaves me in awe at the art it leaves for me in its wake. Thanks to this process, however, my idea is a song. Now, only the finishing touches remain. I can now step back from the artistry, from the colorful folds of creativity, and focus on the nitpicky details that lend music a “professional-quality” sound — but I’d rather not talk about that. That’s a story of precise knob-turning, of careful listening, of objectivity — a world apart, in my opinion, from the creative work that defines the song. The most important touch is what happens inside someone’s head when the music falls upon their ears. It’s no secret that music is a powerful emotional force. Music is made to be listened to, danced to, sung to — music is an active, transient experience. Indeed, music demands to be heard. If my music can’t evoke any thoughts in my listener’s head at all, then I’ve failed as a musician. Worse, I’ve failed as an artist. What, then, makes a great artist? The great artist is one who harnesses the creative process day after day, hour after hour, using its expressive energy in a constant, neurotic drive to create. The great artist lives and breathes the creative process throughout their life, because great artists always have something to tell you. Contact Trenton Chang at tchang97 ‘at’ stanford.edu.